A friend was coming from out of town for some backpacking adventure time in the Olympic National Park. The original plan was to go into a river valley for a few days, with the hope of seeing Olympic Elk and Black Bear. After checking the weather, I suggested a better plan. How about an Epic 'Sea to Summit Weekend'? We used mostly public transportation for this adventure, so total travel expenses equaled three dollars. Started my day, like I usually do. Jumping out of the Sail Boat; as the sun rises over the waterline. Feeling how warm it was outside for a Washington spring day. I knew it was going to be a great weekend. We jumped on the Clallam County Forks Bus to begin the first leg of our adventure. After a stress free ride with views of Lake Crescent. We arrived in Forks for a short layover and then jumped on the Quileute Tribal Shuttle. The lady driver was super nice and dropped us off off on the shoulder of the Highway. We needed to walk a few miles of logging road, in order to get to a 'Secret Trailhead'. This would lead us to private access down the coastline. After a stroll though the logging roads; on a warm spring afternoon. We reached the end of our third leg and begun to walk on plush trial. I greatly enjoy a more of a primitive trail. Gives you the feeling of bushwalking, without actually having to step over blow downs and such. Plus, the trail is still mostly at a natural state. Making it perfect for barefooting; because of the soft surface. After enjoying the forest floor and unique coastal trees. It was time to do some coastal hiking down the beach. Sun was out with a light breeze to our backs. After picking our campsite. The wind was really starting to pick up and the size of the surf also gained in size. The wind reached 35mph that sunny spring day. Once my poncho tarp was pitched. I felt it would be best to build a wind wall out of drift wood. That would give us increased protection since we would need to fit two people under a one person sized shelter. Spent the afternoon drinking water, laying in the sun and lounging around a beach fire. Sounds really stressful, don't it? The next day, after sleeping like a baby. We slowly broke camp and began walking north on the coastline; with the outgoing tide. The way I set up the route was to be sort of a one direction hike, so that we would not have to backtrack. Using buses at both ends of the trailheads. I really enjoyed it this way. I enjoy it more when I don't have to look at my same tracks in the mud. Headland trail sections are usually really muddy, but the few days of sun really helped dry them out. Made good time without having to hop over so much mud. Enjoyed several patches of wildflowers, that were tucked away on the forest floor. We ended up jumping right back on to the tribal shuttle. Even ended up with the same friendly driver. It however would be a few hours before the Forks Bus would take us back to Port Angeles. What better chance to explore the town? We grabbed lunch and relaxed. Even managed to wonder over to a nice little ice cream shop, where we enjoyed a sweet treat. Followed that up with a relaxing time in the local library. Were I enjoyed a nice book; of coarse about the Olympic National Park. The next day we would shuttle up to Hurricane Ridge and enjoy another sunny warm day. The snow was nice and firm. There were no snowshoes needed on this cool spring day. Enjoyed the day exploring over by 'Hurricane Hill' and a little climb up to 'Sunrise'. Hurricane Ridge Visitor Center looking into the Bailey Range. View from 'Sunrise'. It was nice looking into the Bailey Range. I will be traversing this route, later this summer. 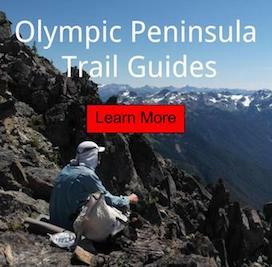 During this I will be circling the Olympic National Park. Connecting as many pre existing traverses of the Park that I can. It will total over 200 miles. I'm very excited for this. Overall it was a great weekend warrior adventure. 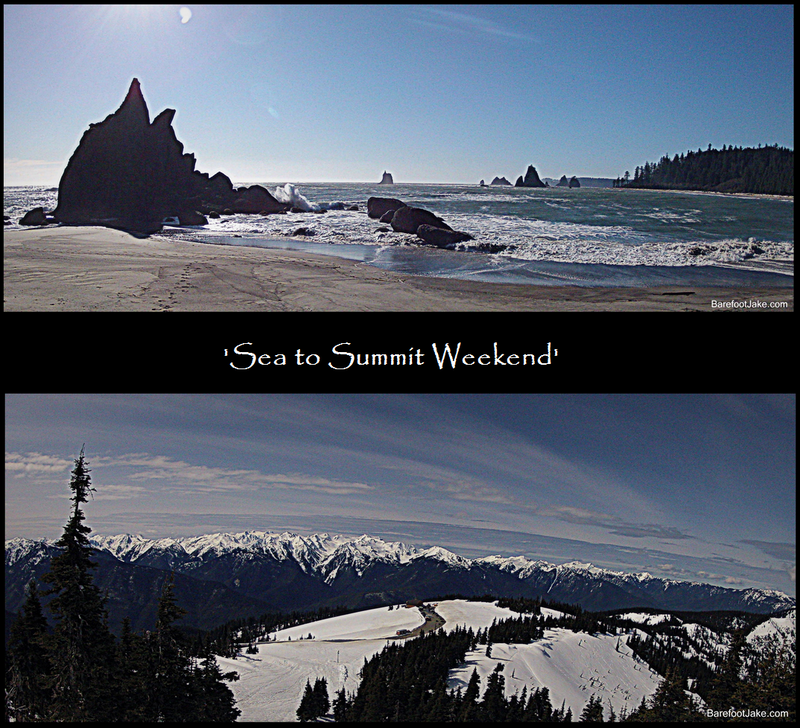 Its cool to visit the coast and then the mountains of the Olympic Peninsula.